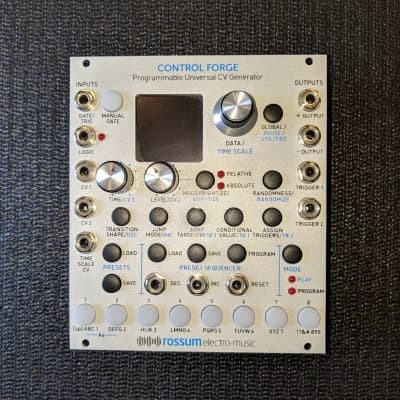 CONTROL FORGE is hard to describe briefly, as it’s unlike anything else available in Eurorack (or pretty much anywhere). The core functionality is drawn from the E-mu Morpheus’s insanely powerful (but hard to program on a two-line display) Function Generators. But now expanded into a supremely flexible modulation source encompassing elaborate one-shot contours, evolving cyclical patterns and sequences of arbitrary length and complexity. 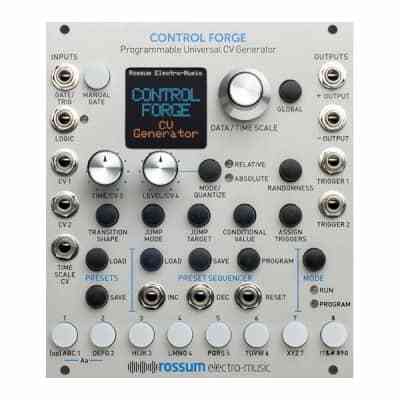 – At its most basic, it’s an 8-stage function generator with variable time and target voltage level for each stage. – Each stage’s level can be defined either absolutely or relative to the ending level of the previous stage and can optionally be quantized to the nearest 1/12 volt. – Each stage’s level may have a user defined range of randomness of either linear or gaussian distribution. – The time scale may be modulated under CV control or manually via the encoder during runtime. – There are 191 different transition shapes between stages (indicated graphically on the display during selection), from linear and exponential shapes to various flavors of random, chaotic, and many more that don’t lend themselves to one-word descriptions, including the ability to pass CVs directly through to the output for individual stages. 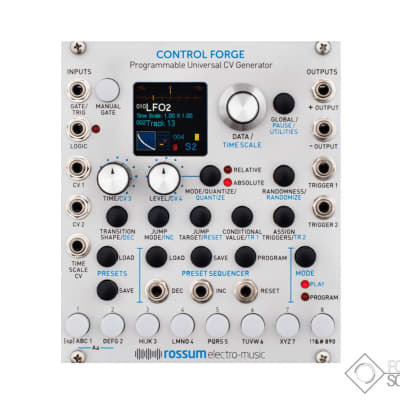 – Also included are “DC” shapes that allow the module to be used as a sequencer with all of the module’s available programmability. When combined with the Preset Sequencer described below, sequences can be hundreds of steps long and modified in real time manually or by CVs. – Each stage may optionally have a conditional jump mode that results in a jump to another selected stage if a particular condition is met. E.g., a CV being above or below the selected conditional value, the presence or lack of a gate or logic high at their respective inputs, rising or falling edges at the inputs, etc. So, in addition to one-shot shapes, extremely elaborate cyclical patterns can be programmed that evolve based on the various conditional inputs. – Two independent triggers can be programmed to fire in response to a variety of events and can be used to affect either CONTROL FORGE itself or external modules. – A preset sequencer allows stepping through user defined series of presets under trigger or clock control. This allows contours and sequences of almost unlimited length and complexity. 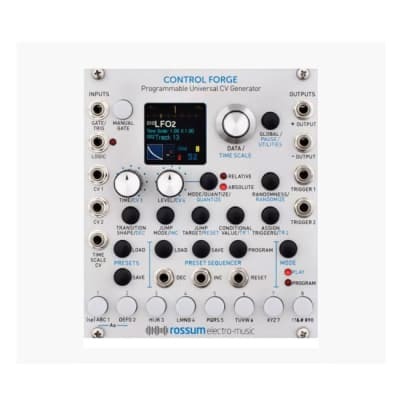 – All presets and sequences can be transferred to any number of CONTROL FORGE SATELLITES.